What tools manage the workflow in today's world? Lets summarize the tools and processes available to the independent shop owner, service advisor and technician to manage workflow. Not one of these 11 pieces can be skipped. Service advisors are super heros juggling 11 disjointed "management tools" at any time during the day. How do they do this? Super hero ability, you knew it already. In order for the service advisor to juggle all this successfully, they often skip or at least minimize the engagement with the motorist. Lets repeat that with different words:"Service advisors skip advising service because they are too busy doing busy work because the tools available are inadequate." Do you agree, or am I smoking something here? You as owner can't measure behavior today, only results from the POS reports. you don't know why the vehicles are in the shop for way too long. Is it the waiting for parts or the service advisor or the dog ate the home work? How to we turn 11 disjointed tools into 3 integrated ones? You add a tablet(1) to the techs toolbox, replace the paper rack with a second screen(2) and download SmartFlow(3) to the tablet from the App Store or Google Play and add it to the browser bookmarks on the second screen. 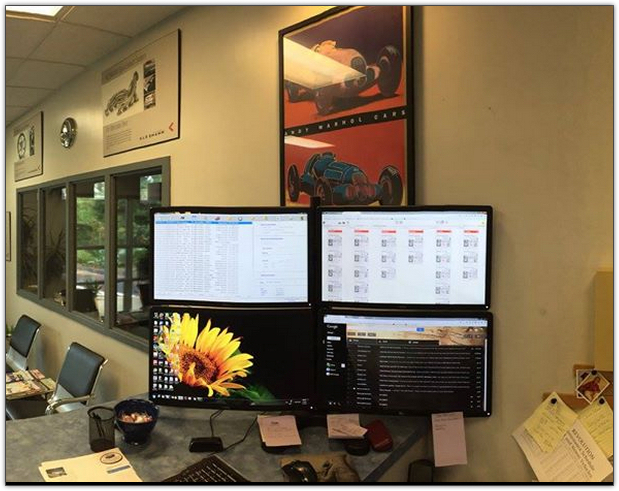 The photo credit goes to Matt Purselle, he turned a typical two screen setup into a four screen setup. One screen for the POS, one for SmartFlow, one for email, one for everything else. Two are enough for the beginning, some of our clients use only one and it works too, thanks to built-in alerts. Matt's counter looks like this seen with the eyes of the service advisor(s). How do the techs know what is going on? they clock in on the tablet, EVERYTHING is on the tablet now, Identifix, Alldata or Mitchell, work order, inspection sheet, any info they need. They stay at the vehicle and smart-chat with the service advisor and get alerted about new info and new assignments for them. Have you introduced a daily huddle with the techs? 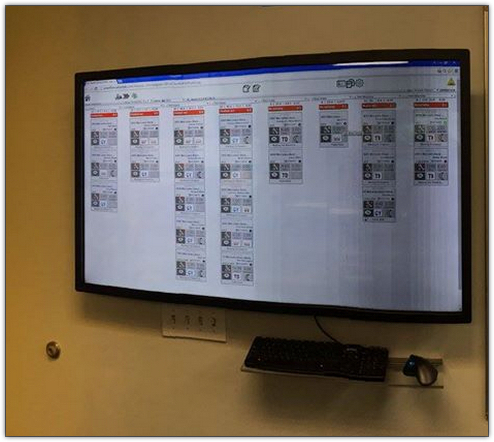 Great, do it like Matt and use a 55 inch screen with touch overlay to manage the day. Service Advisors are freed up, and can focus on the customer. All recommended actions by the tech are on the estimate now. You can measure and correct tech and service advisor behavior. Pencil whipping, over recommedning, time on the vehicle, tech efficiency and productivity, shop proficiency, anything you want really, since you are digital now. Ask SmartFlow users in your area or us. We've been using Autovitals for 1.5 years now....it's definitely the future for auto repair shops! The independent automotive repair industry has been waiting for a technology company to recognize the severe gaps in the software available to our industry...Autovitals IS that company!! Autovitals has brought to my shop a tool that I have been wanting for many years now but did not know how to put together or where to find it. This system will help all the process in your shop in ways you never thought possible. The only issue you will have with it is why you didn't start with it sooner. It is VERY reasonably priced for what you get and there are a few levels to choose from. They also have a special program for all the NAPA AutoCare Centers out there. And how much is that exactly? All these one post wonders coming out of the woodwork, SO HOW MUCH IS IT? if your going to advertise here, advertise, tell us the cost and we will decide where to proceed, not giving the costs only tells us its way too expensive. SmartFlow starts at $189 a month, and comes in different flavors and features, depending on exactly what you need, you can get the tablets from us and other additions. We offer discounts for affiliations with NAPA - AC, TECH-NET, ACDelco-PSC, ATI, etc. Just call at 866 9494 2848 and ask for Tom in sales and we tailor SmartFlow to your shop. Our shop began with AutoVitals well over a year ago with Digital Inspections. We are now SmartFlow enthusiasts that cannot imagine life before. As the only Service Advisor for 4 techs, I have more tools to save time and better inform and engage with customers both new and existing.. What is the result you may ask ? An increase in ARO $$$, shorter phone conversations for approvals because the customer has had the opportunity to review actual pictures ( and educational ) videos. Time saving chat messaging with audible links for the technician and advisor speeds up communication !! This feature keeps the tech working, and allows the SA to continue to work the magic that we do. Technicians have immediate access to customer history at their fingertips as well as previous recommendations and factory service schedules. The retention side is AMAZING !! Reminders are automated and customized to be sent when you want the "audience" you choose to target. You have a Solutions Advisor that makes the process as easy as can be. No more being put on hold for eternity or the never returned call from nameless CRM companies. Customer call backs are now on your dashboard, so no more stacks of work orders or stickey notes all over the place. There is even a smart phone app, for customers to have quicker access to your shop as well as appointments and service history. The entire AutoVitals staff is truly dedicated to making your business as efficient and profitable as it can be possibly be. Features are being added on a regular basis and when they are added, you will find that many come from suggestions that are discussed by other users and staff on multiple user forums and workshops. If you don't want your shop to be left behind in the advancing digital age, you ABSOLUTELY need AutoVitals.